It happens to almost every chicken keeper eventually, I think. Your girls are putting out the eggy goods faster than your family can eat them. Our flock as it currently stands has gifted us up to a dozen eggs in a day, and 8-9 per day is pretty typical. When I find myself staring at a refrigerator or counter full of eggs, I have a few go-to strategies for using up the bounty. You may know these cooked-in-their-own-shell-ovum as “Hard Boiled Eggs.” I did too, until culinary school, when a chef-instructor drilled into our brains that you never, ever, under penalty of shame, humiliation and possibly death, boil an egg. Ever. We were instructed to call them the more accurate hard cooked eggs, and so I do. Hard-cooked eggs are kinda boring, sure. But they are also the perfect, portable, tasty high-protein snack. My kids are like Jack Spratt and his wife when it comes to hard-cooked eggs. My daughter only likes the yolks and my son only likes the white. It works out. I see pre-cooked eggs in their shell at my local Yuppie-Hippie Market. Those things are being sold for a buck each – unpeeled. That’s crazy-talk, especially when you consider that a dozen unpeeled, hard-cooked eggs will last in your fridge for an easy week or 10 days. I think if every gym-rat hopped up on protein shakes would just switch to homemade hard-cooked eggs, a bazillion dollars a year could be saved and every hardbody would stay just as shredded. So, when I find myself with a glut of eggs, the first thing I do is hard-cook a dozen of the oldest. As an egg ages, the air sack gets bigger and the shell becomes far, far easier to peel when hard-cooked. I prefer to hard-cook eggs that have aged about a month in the fridge, or at least 3-4 days (a week is better) at cool room-temperature. My preferred way to hard cook eggs is to get a pot large enough to hold all the eggs you want to cook in a single layer. Set your eggs in the pot carefully, and add enough cold water to cover the eggs by about an inch. Bring the pot of water to a hard simmer uncovered. As soon as the water hits that almost-boil point, slap a lid on the pot and remove the pot from the heat. Set a timer for ten minutes and leave the pot alone. While the timer is counting down, get a bowl of ice water set up to shock-chill your eggs. Use plenty of ice, and just enough water to make it slushy. You want to cool those eggs in a hurry. As soon as your ten-minute timer goes off, use a slotted spoon to transfer the eggs from the pot of hot water to the ice bath. Let your eggs cool for at least five minutes, then crack, peel and eat (or refrigerate for later use). Ten minutes reliably gives you fully cooked but creamy yolks. Adjust time up or down by a minute or two depending on the doneness you prefer (I actually prefer 8-minute eggs but the kids think they aren’t cooked enough.) Don’t overcook or you’ll get the dreaded green-grey ring around your yolks. Ick. From hard-cooked eggs comes egg salad – my kids love any mayo-bound “salad” sandwich – and that retro favorite, Deviled Eggs. I find I can use up a dozen eggs pretty fast if I make a batch of egg salad sandwiches for lunch. Speaking of mayo, I also use my friendly backyard fresh eggs to make Magically Fast and Easy Mayonnaise. It takes less than a minute to whip up a pint-jar of fresh mayo if you have my favorite kitchen small appliance, a stick blender. These are all just variations on a theme. Egg casserole is pretty much crustless quiche. Take out most of the extra dairy and make the whole thing thinner and less custardy and you’ve got a frittata. The best quiche in the world comes from world famous über-chef Thomas Keller. His recipe for quiche in the tremendous Bouchon Cookbook is roughly 76 pages long, and takes about 3 days to complete (slight exaggeration). It’s totally worth it, except, you know, when it just isn’t. 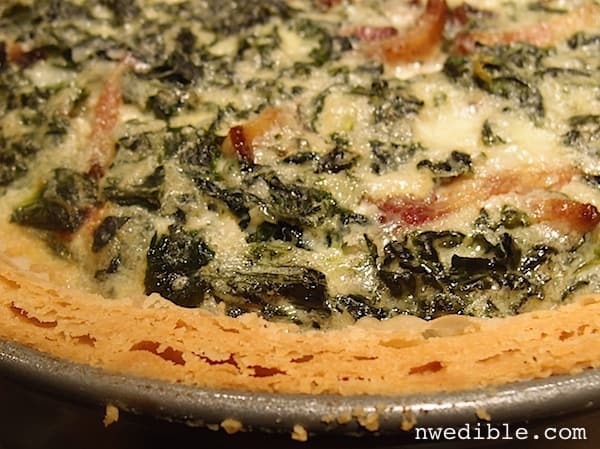 Smitten Kitchen does a great job of (slightly) simplifying the Bouchon Quiche recipe here. Or you can read the full thing here. When I can’t find a spare long-weekend to devote to making quiche, I make egg casserole, aka baked eggs. I don’t have a recipe, and I’m not sure this dish really needs one. Take a bunch of eggs. Whisk the heck out of them together with salt, pepper, freshly grated nutmeg and a good splash of cream. Add in some cooked, drained greens – kale is nice because it doesn’t throw a lot of water – or whatever cooked veggies you have left over in the fridge. Mushrooms, potatoes, peppers or roasted asparagus are all nice. Some cheese and some diced up cooked ham or bacon or sausage is good, if you like that kind of thing. Put the whole mixture into a buttered baking dish or deep skillet and cook at 350 until the center is no longer wiggly, about 30-40 minutes. If you are squirming for proportions, this recipe for egg casserole looks very similar to what I do, except I don’t typically add extra yolks to my egg casserole. 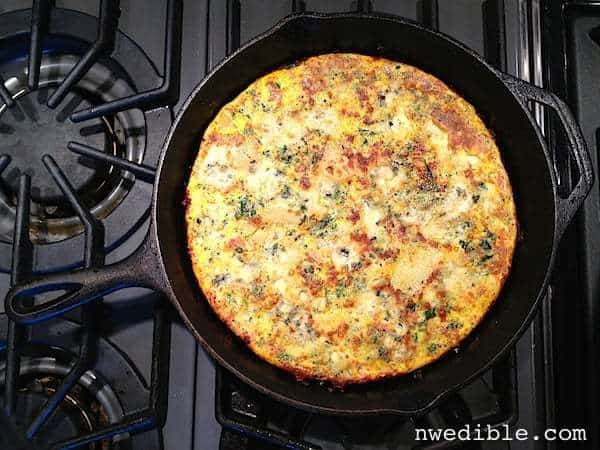 A frittata is even faster, since it’s mostly a skillet/stovetop thing and you just pop it under the broiler to set the top at the last minute. Alton Brown has a good basic, adaptable recipe but for the love of indoor air quality, use a cast iron skillet, not a coated non-stick pan, okay? Eggs are already a fast, easy breakfast, but if I serve my kids scrambled eggs every morning for weeks on end, they start to protest. So I also convert some eggs into a more diverse selection of breakfasts that are easy to pull from the freezer. I’ve found the easiest way to do this is with baked goods. A few kid favorites are French toast (if I plan ahead, I like to make a loaf of cinnamon raisin bread and use that to make French toast ), waffles, pancakes, morning glory muffins and, seasonally, zucchini bread or muffins. 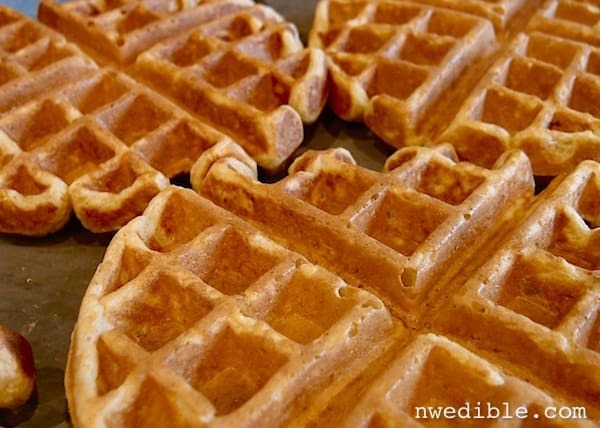 Typically on the weekend I’ll just whip up a double batch of whatever easy-to-freeze breakfast item sounds good, serve some for breakfast and pop the rest in gallon-size ziplock freezer bags. The extras are stored in the freezer and then the kids have that option when we need a fast weekday breakfast. You can freeze raw eggs for later use – like when all your hens go on strike and egg production drops to nil. Eggs will keep for a year when frozen. Freezing eggs isn’t hard, but I highly, highly recommend freezing them in portion-sizes that make sense. For this, it helps to have a ice-cube tray or a silicone muffin tin. You have two options: to separate, or not to separate. 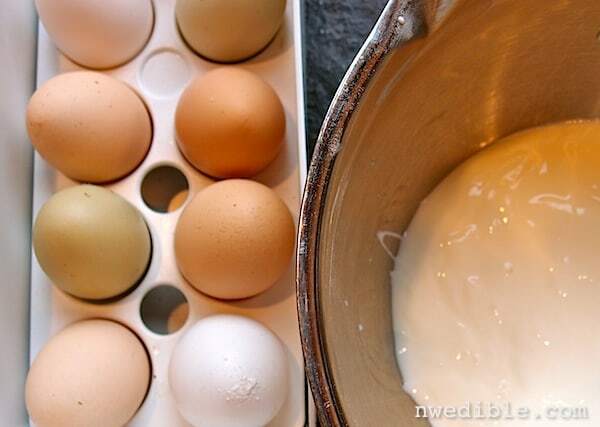 If you want to freeze whole eggs for later use, crack the eggs and blend until totally combined. I like to use a stick blender for this, but an actual blender or food processor will work too. 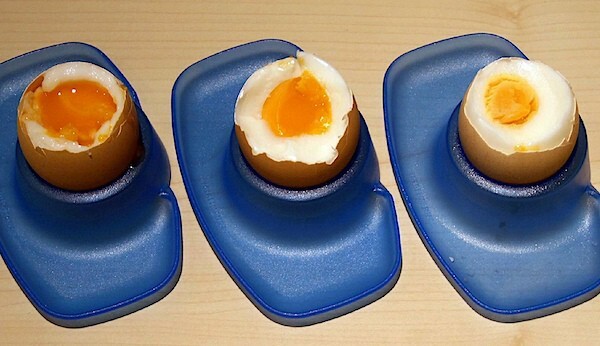 Carefully fill silicone muffin tins with 1/4-cup portions of eggs. Each 1/4-cup portion is equal to one egg. Once thawed, you can use these frozen whole eggs for any baked good or for things like egg casserole. Personally, I wouldn’t use frozen eggs for omelets or scrambled eggs, but you could in a pinch. Freezing the yolks and/or whites separately is a good option when you are doing a lot of baking and your yolk or white usage is uneven. This happens to me when I make custards or curds that call for extra yolks (leftover whites) or meringues that call for lots of whites (leftover yolks). To freeze egg components separately, crack and separate the eggs. Be careful that you don’t get any yolk into your whites – this stops whites from whipping well later. The whites can be frozen as is. Place one white in each cell of an ice cube tray. When whites are frozen, pop them out and keep in a freezer container. Yolks are a bit trickier. They get too gummy to use if frozen as-is. Once you’ve separated your eggs, for every 4 yolks, add 1/8-teaspoon fine sea salt (for savory applications) or 2 teaspoons sugar (for sweet applications). Whisk together and carefully fill your silicone muffin tin with 1/4-cup portions of eggs. Each 1/4-cup portion is equal to four yolks. Breakfast for Dinner. This is a real thing in my house, I’ll even put it on the menu plan. For some reason if I serve scrambled or fried eggs at night, the kids think it’s terribly fun and eat their eggs without complaint. But serve those same eggs in the morning, and I get picky forks. Pound Cake. Traditionally made with a pound of eggs and it freezes well. Great go-to dessert. I like this classic version. Share, Gift! Give away a dozen eggs and earn goodwill from friends, neighbors and co-workers. What do you make when you are over-blessed with eggs? All of Thomas Keller’s cookbooks are must-haves for dedicated foodie-types, but Bouchon is my favorite. 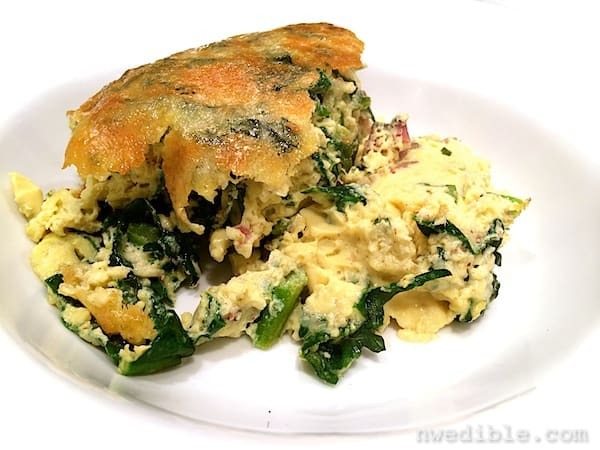 Three-day quiche notwithstanding, the food is delicious and refined but approachable. For freezing eggs, stock, baby food and other stuff in smaller portions, I really like silicone muffin tins. Because they are flexible, it’s easy to pop the contents out once frozen and transfer your little pucks of frozen food to a freezer container. Silicone ice cube trays are handy, too, if you have them, but regular ones work too. I have two plastic holders for my eggs. One came with my refrigerator and the second one I found for a dollar at Value Village. I really like having durable, dedicated egg holders – this one holds 21 eggs. I love, love, love my stick blender. I use it for everything from soups to mayo. The exact model I have isn’t sold anymore, but this one is similar. I make angel food cake with 12 egg whites and use the 12 yolks for either lemon curd or pastry cream. Use either on the angel food cake. I like shirred (baked) eggs with letftover veggies ( http://artofnaturalliving.com/2013/02/28/shirred-eggs-with-vegetables/ ) since they can be made in single serving sizes and I get a serving of veggies in at breakfast. Always a great way to start the day! My holidays seemed to be very egg-yolk intensive, so I have a number of egg whites frozen. That was one of the best things I learned this year! MANY years ago when I was in high school, my mother would occasionally make my lunch and would make egg salad sandwiches on whole wheat bread. My boy friend at the time, offered to trade almost anything to eat those sandwiches. Stupid as I was at the time, I occasionally let him have one. They were so delicious ! My entire family loves deviled eggs. I could make 5 dozen and I think they would be devoured in a flash. And a bonus on the boiled eggs….use the cooled cooking water for plants, they love the calcium it contains. Sodium silicate is the same stuff they make the Magic Crystal Gardens out of. You can find the powdered stuff on Amazon. Nigella Lawson’s clementine cake takes 6 eggs…I like it because it’s very easy to make, uses lots of eggs, is gluten free (good for potlucks/social events) and is adaptable for eating at all times of the day! Also, Cooks Illustrated published a hand-rolled pasta recipe a few years ago that uses 4 yolks for enough pasta for about 4. I love making it when people come over for dinner because it’s delicious, easy and leaves 4 egg whites for making old-fashioned cocktails to start the evening! I’ve been bringing eggs in to the office lately, a few dozen. Everyone’s been super appreciative…and I didn’t really understand why until I stopped by the market the other night and swung along the dairy section…and saw what good quality eggs are going for. Damn, those were some kingly gifts I’ve been bringing in! Great ideas in here! As a kid, my family did meatless Fridays all year (super Catholic). So Fridays were all about eggs — in “lost bread” for breakfast, in tuna salad for lunch, and scrambled on white bread sandwiches for dinner. Now that we keep chickens, I find that sharing any extras usually works best for us, and it gives us an excuse to drop in on the neighbors and see what they’re growing. We have ducks, not chickens; when we have the abundant egg “problem” I like to make a 1/2-gallon jar of pickled eggs. They taste as good as deviled eggs, but less fuss (you still have to peel them, though). Add some beets and you get lovely pink eggs! Our go-to is the frittata. You can dump a dozen eggs into one and they keep very well for a few days. Dogs also love to eat excess eggs. We just drop them in the bowls and they eat them shells and all. This has been a crazy egg year. The ducks never stopped laying, so we built a big stockpile in October and then kept getting up to a dozen eggs a day. Too bad we don’t have any neighbors that we don’t like. 10 minutes may work for hard cooked eggs at sea level or thereabouts. Here in Chestermere, Alberta we’re at 3000+ ft and water boils at 205F or so. Denver would be worse. I use about 22 minutes for well done yolks which I prefer. As Erica says, you need at least an inch over the eggs to have enough residual heat in the water to cook the eggs. My one big flaw as a cook is a total inability to hard-cook eggs. I have an egg cooker that will hold 7 eggs (a weird number, in my opinion) that I use. I’ve also resorted to scrambling old eggs and feeding them back to the hens, when the freezer is full and I can’t face eating another egg myself. They love them! This post is urging me to make that call to the handy man whose help I need to revive the chicken coop. I so miss fresh eggs. Like REAL fresh, still warm. Tap small end of cooked egg with back of spoon to crack. Peel this. Wet the spoon and run the bowl between shell and white to shuck an egg in 10 sec. You’re always a wealth of knowledge. I wish I had the problem of too many eggs, but for now it is useful to know how to best freeze egg yolks. Sometimes I made an angel food cake and don’t always have time to make the yolks into a curd. Thanks! We never have left over eggs. But, we are a heavy egg eating breakfast house. French toast (stale french bread soaked overnight), Saturday morning crepes (a multi generation family tradition), and ‘german pancake’ (not sure that is what it actually is, but that is what we call it) all about once a week means we usually are buying eggs in the winter. German pancake: drop 2 tablespoons of butter in a pie dish and put in oven heating up to 350. Mix 6 eggs, 1 cup flour, 1 cup of milk all blended together. When butter is melted, pour in dish. Stick in oven until all raised up (about 30 minutes). Serve with powdered sugar and lemon. Its a great breakfast to start when you first wake, get ready while cooking, eat and then go. Steaming eggs changed my life (well, a little). I read this: http://www.kokoscornerblog.com/mycorner/2011/04/easy-peel-hard-boiled-eggs-guaranteed-.html and some similar things and tried it. This worked like a charm. Steaming the eggs produces a guaranteed easy-to-peel egg even when fresh, and even when soft-cooked. 6 minutes produced the perfect soft-boiled for me. 10 minutes does produce a softer center than I prefer for hard-boiled, but actually ideal for many uses. Usually I do 11 minutes for deviled-egg purposes. If you cool in cold water, then refrigerate in shell, it is still very easy to peel even with fresh eggs. I’m with Beth Grim on this one–pickled eggs are THE BEST way to use all the extra eggs our girls give us. They keep well in the fridge and everyone loves them. Thankyou. I never knew that you could freeze eggs. We have too many at the moment and I did ask friends that question but only received blank looks. That’s fantastic for when the girls go off laying and a glut becomes a distant memory. Am on it! The hardcooked eggs worked perfectly for me at altitude. Thanks! Still not fun to peel though. As to the hard cooked eggs, I use an electric kettle to make tea so when I want an egg (or two) I set them in and the kettle shuts itself off when it gets to the boil (no babysitting the pot). Sits for 10 min, pour off a cup and then to the chill down. I’ve been making pudding recently. The recipe calls for 4 whole eggs and it makes about 6 servings. If you need to spread it out for more people, making the pudding vanilla and layering it with nilla wafers and sliced bananas helps. Other popular dishes that I make are cherry calfuti and lemon meringue pie. Trying to sneak eggs into other things like snacks and dinners help, since we already eat eggs daily during breakfast. I have a pie crust recipe that also uses eggs which makes it light and flaky! I have stopped boilling eggs entirely!!! 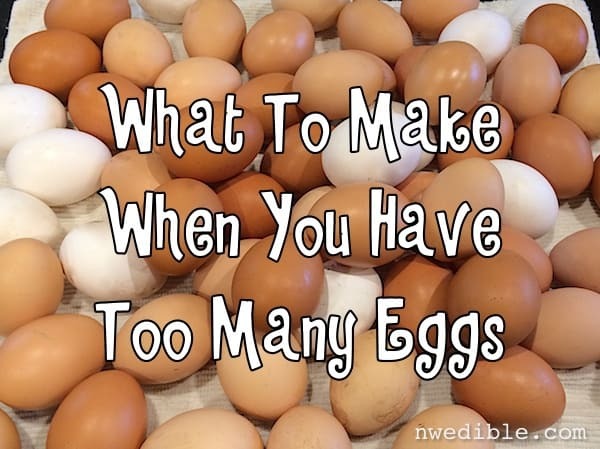 Last year i found this fabulous post about hard boil eggs …. Not just old eggs, fresh ones too! I moved into an apartment and didn’t eat my eggs fast enough. I got about 6 and they expire tomorrow. I keep my apartment kitchen as clean as possible to avoid catching possible bugs from other people’s apartments. So I really hate cooking since 90% of my time cooking involves cleaning and bleaching everything. I better eat more of my eggs next time to avoid having too many by exper date. I’m still learning the living on your own life. Great article thank you but please, please, please do not use “gifted”. It is not a word! Gift can be a noun or a pronoun or even an adjective but never a verb. The verb you were looking for is give, past tense given. Again great article, just the information I was looking for as I am in the same boat as you with anything up to 10 eggs per day and only the two of us to eat them.